A while ago I posted about trying to use less product to make our stored items last longer. See https://apartmentprepper.wordpress.com/2010/05/30/using-less-of-everything/. We can only store a limited amount of everyday items, due to our lack of space, so our challenge is to make each item lasts as long as possible, so we don’t have to keep using up and buying more. At the same time, we can figure out inexpensive substitutes for commonly used items. We finally saved up enough to buy the rest of the materials/equipment to accomplish this such as: campfire popcorn popper (or small covered skillet), green coffee beans, manual grinder and french press. I will tell you exactly the steps I did and the result. 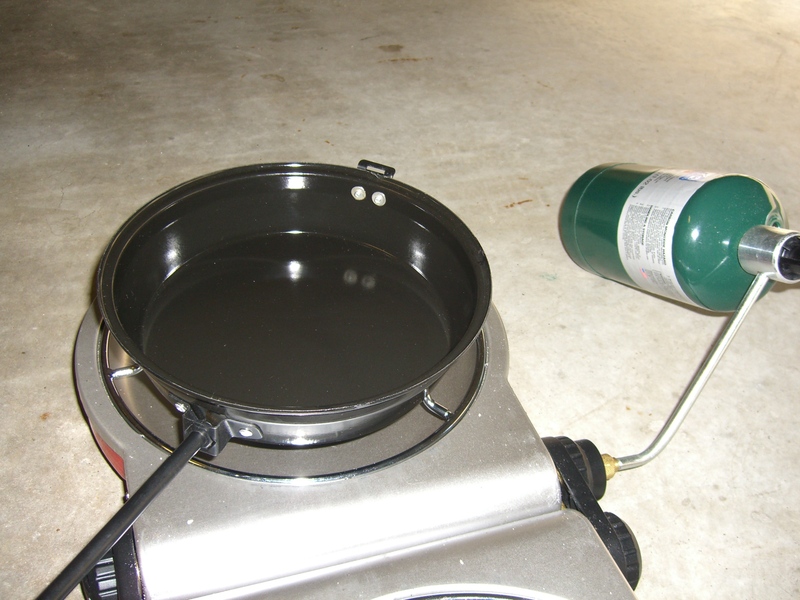 Since I am trying to have a backup plan in the event of an emergency and we are off-grid, I used our propane camp stove. Warning: I do not recommend using a camp stove in your kitchen: this would be unsafe and can cause carbon monoxide build-up. Camp stoves should be used outside. Also, I read from various articles that roasting green coffee beans may cause a lot of smoke. Our apartment has a very sensitive fire alarm which gets set off very quickly, so we did this outside, so the fire alarm does not go off. We don’t want a visit from the fire department from having the fire alarm go off while we are roasting our beans! If you are roasting on a stove indoors, turn on the exhaust fan or open a window to make sure your area is well-ventilated. 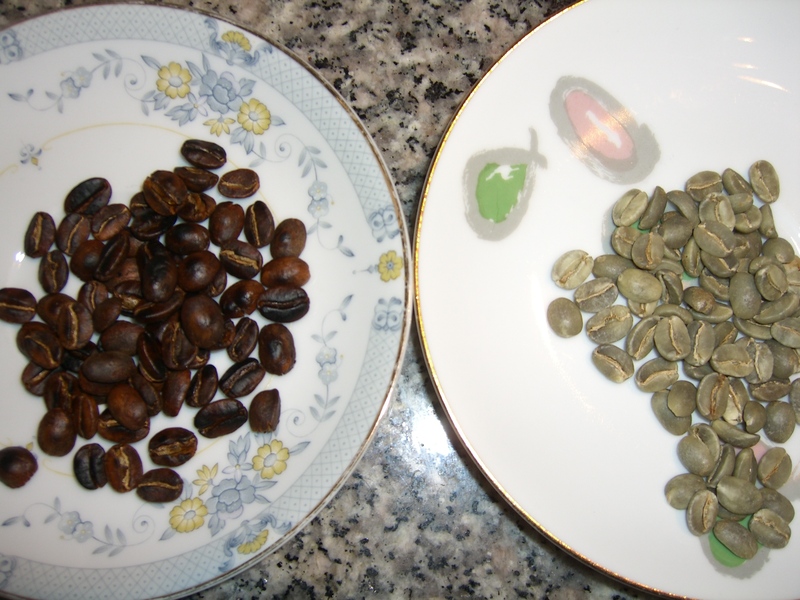 To start small, I measured about a quarter of cup of green coffee beans. Turn on the fire to low setting. Preheat the popper on low flame. Pour the green coffee beans into the skillet/popper, cover and shake. I held the popper steady for five seconds then started moving it around. Keep the popper moving around and start listening for a popping sound. Check under the lid and look at the beans. They started to turn brown after about 5 to 7 minutes. 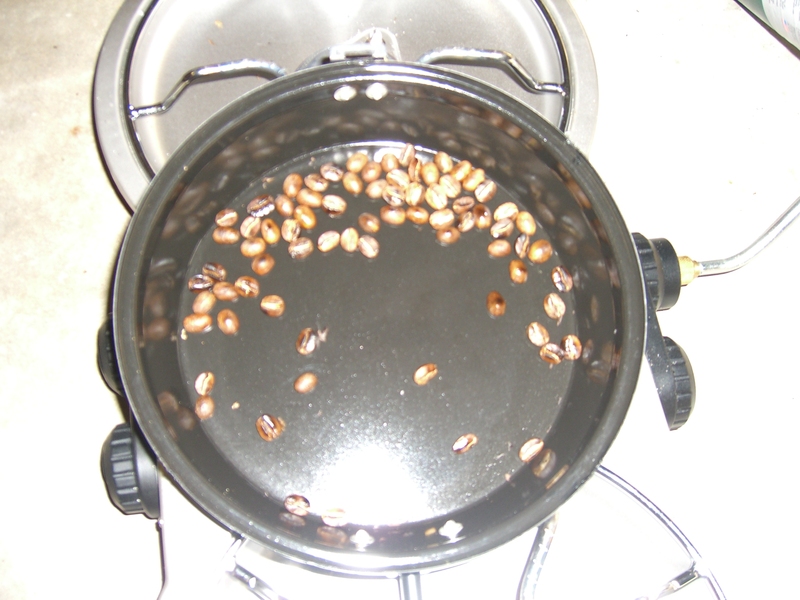 The popping is not constant like popcorn, but happens every few seconds as the beans crack. This is about the time the beans start to smoke a bit. After about 10 minutes, I checked again and it looked like the beans were brown so I turned off the fire. You will notice some bits of chaff: pour into a wire colander or just blow on the beans and the bits fly off. Now you are ready to grind the beans. These photos show the difference between the green beans and the roasted beans. The smell is also quite different: the green beans do not smell like coffee at all, they have a pungent, plantlike smell, while the roasted ones indeed smell like the strong coffee smell we all know. The aroma does linger long after you have finished roasting them. 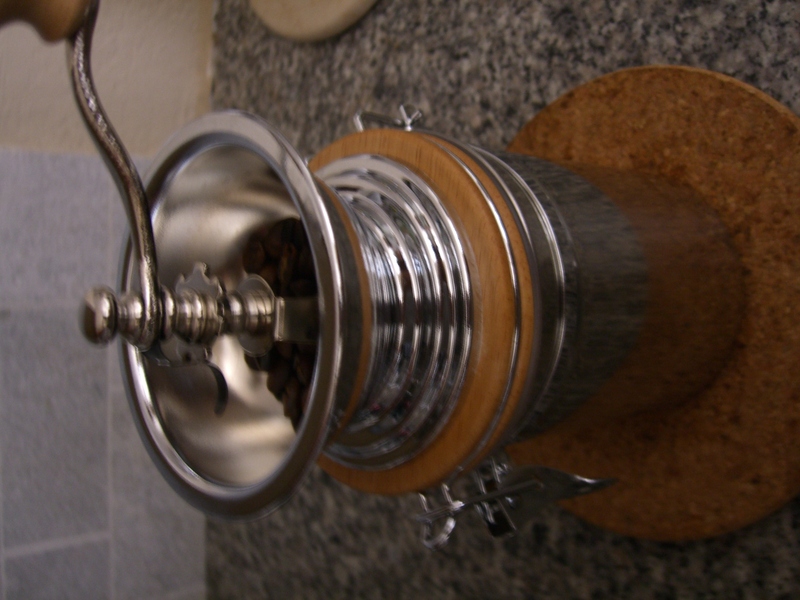 I used the Danesco Manual Coffee Grinder. Adjust the grinder for maximum coarseness, if you will be using a french press. To do this, take off the handle and adjust the cog wheel up and tighten it back up. 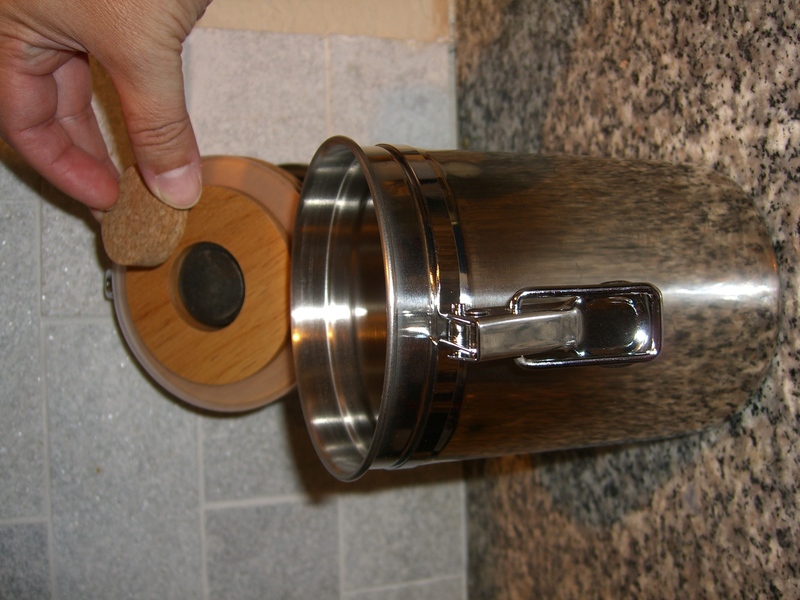 The grinder does not have any cushioning under the bottom, so you will need to stabilize it on the counter by placing a towel or pad underneath. Remove the cork stopper from under the grinding mechanism. Pour the beans and start grinding. 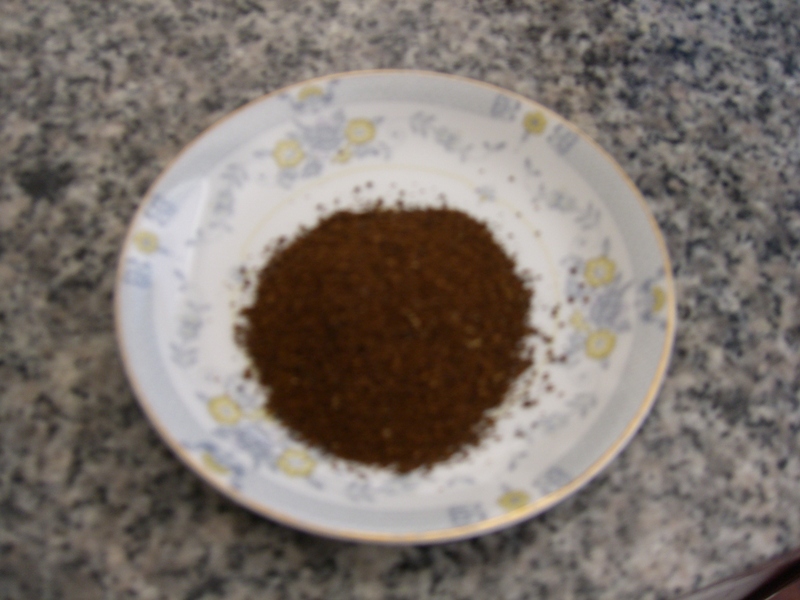 Hold the grinder stable with the left hand and grind with your right hand (vice versa if you are left-handed). I have to say this was the hardest part! It took a bit of muscle power to continuously grind the beans and hold it down. All in all, it took about seven minutes to grind the quarter cup of beans. 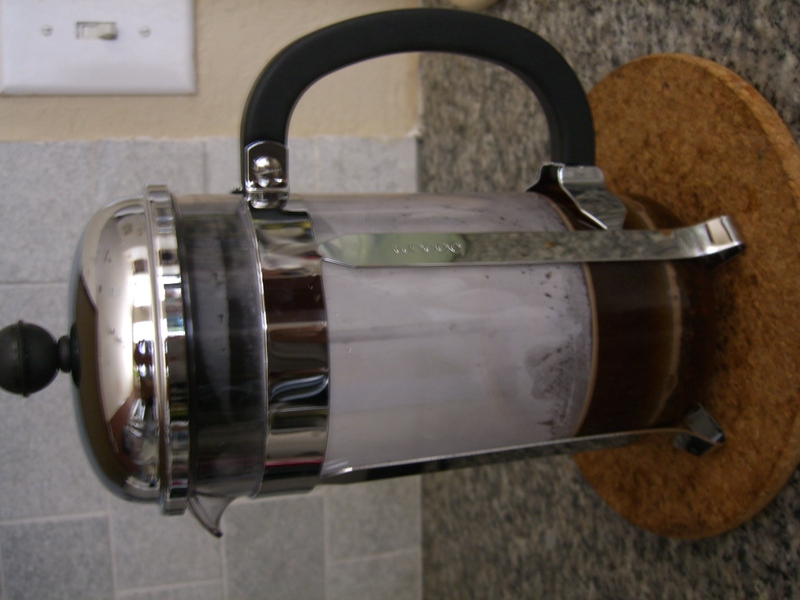 I used the Bodum Shatterproof (AKA plastic) 8 cup French Press Coffeemaker. Eight cups sound like a lot of coffee, but actually, the “cup” is actually a 4-ounce cup, not an 8-ounce mug that most of us are used to. The quarter cup of whole beans made about 2 level scoops (measuring scoop came with the french press) of ground coffee. The rule of thumb is to use one scoop per cup of coffee. 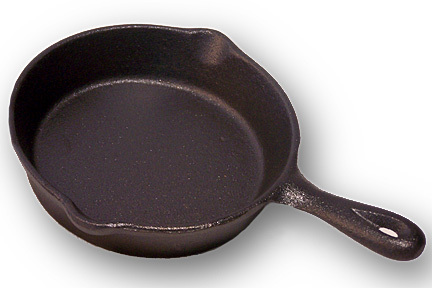 Boil water in a separate pan. I boiled about 2.5 cups of water. Turn off fire once the water boils. Because this is a plastic press, the instructions indicate the water must be hot but not boiling. I would think a glass french press would work with boiling water. Remove the cover/plunger of the french press. Pour the ground coffee into the bottom of the press. Slowly insert the cover/plunger. Turn the lid so the opening/pour spout is sealed and away from you. and press the water/coffee gently until plunger cannot go any further. Do not apply too much pressure or this may cause the water to splatter up. Once the coffee is pressed, it is ready to drink! I have to say this was a fine cup of coffee. It seemed like a lot of work for two cups, but it was worth it. 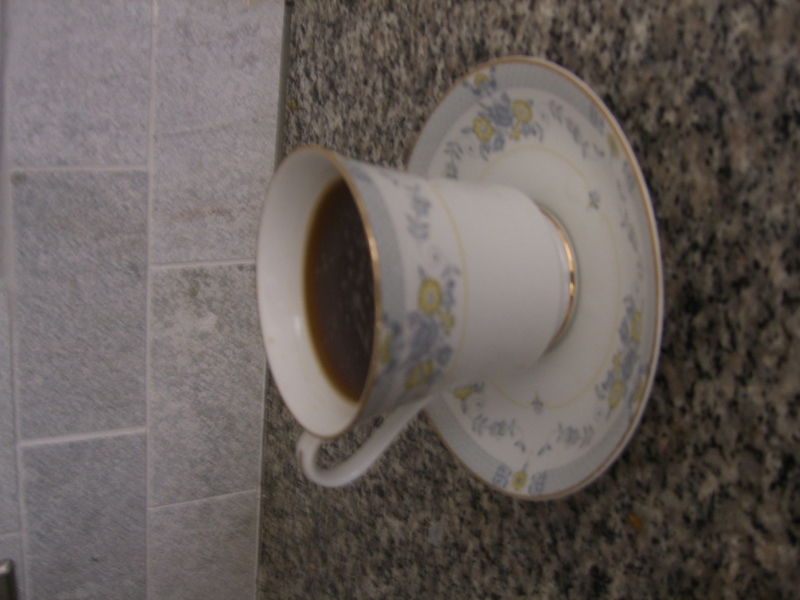 The result was a very fresh tasting, strong cup of coffee. 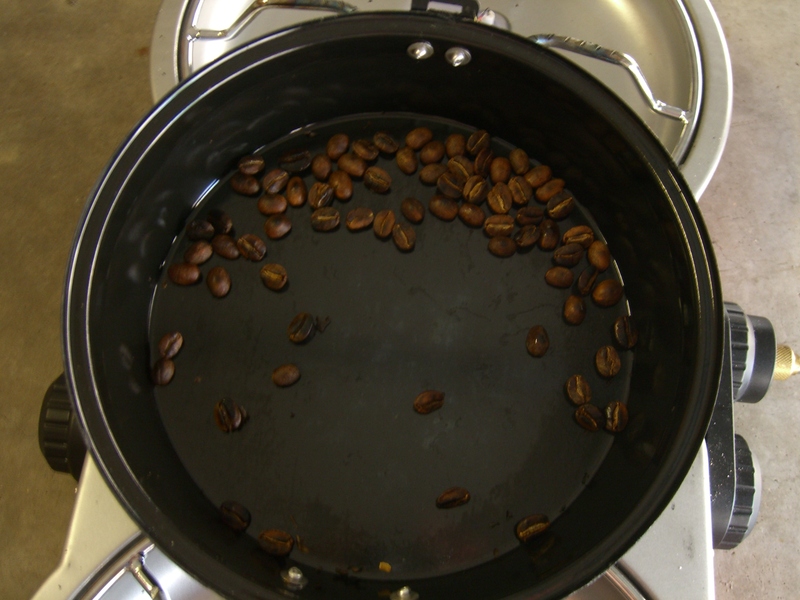 Roasting the green coffee beans was not hard at all; I can roast a larger batch next time. My husband and I both like the coffee and will be using the french press on weekends. I am happy we are able to roast and brew coffee off the grid! In addition, with the price of coffee going up, it is cheaper to buy green coffee beans and roast it yourself than buying it roasted. Even if we never need to make coffee off the grid, I now know I can save money on my daily brew.